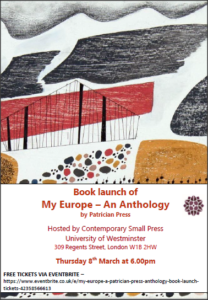 My Europe – A Patrician Press Anthology has gone to press! The publication date is 23 March 2018. Mark Brayley, Anna Johnson, Petra McQueen and Ken Smith who contributed to the anthology will be reading. Suzy Adderley, Wersah Bhadradwa, Giacinto Palmieri and George Szirtes as well as others who contributed to the anthology will be reading. Hopefully Stephen Timms MP will also be attending. Our final event will be at 2.30pm on Sunday 11th March at Firstsite Gallery in Colchester (in the Learning Studio). We are holding a panel discussion on Europe and the Arts chaired by poet Mark Brayley. 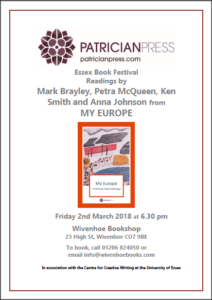 We are thrilled that Anthony Roberts, Uwe Derksen (who contributed to the anthology), artist Joanna Jones and novelist Liz Trenow will be on the panel.